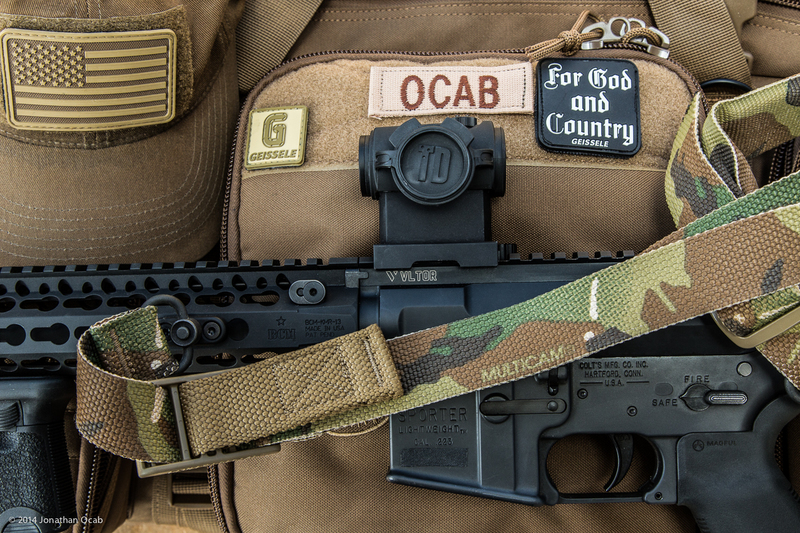 I recently picked up a Blue Force Gear Vickers Combat Application Sling in Multicam for use with my most recent AR-15 16″ mid-length build. 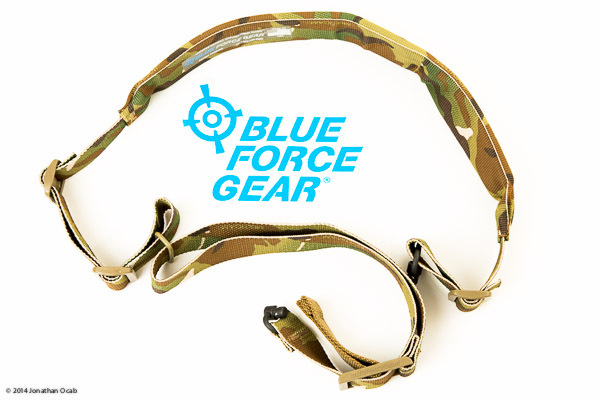 The Vickers Combat Application Sling, or VCAS, is a two-point sling that was designed by both Larry Vickers and Blue Force Gear to create a quality, two-point quick adjust sling. When I was piecing my rifle together, I ‘blindly’ ordered a Magpul MS4 Multi-Mission single point sling. I used some single point slings several years ago, and I still have a Specter Gear single-point for my Remington 870 shotgun. But I mainly picked the Magpul because their single point slings are commonly used, and is readily available with the QD swivel, which mates easily to the Magpul UBR stock that I have. After using the Magpul MS4 during the initial break-in of the aforementioned AR-15 build, I found that I wasn’t liking how the MS4’s single swivel point just seemed to be rotating in the way of my thumb, causing me some hinderance in manipulating the safety. I also just didn’t like how the rifle felt on the body at rest. I’ll admit that the MS4’s strong point is that it is probably the best weapon sling to have when switching shoulders (e.g. 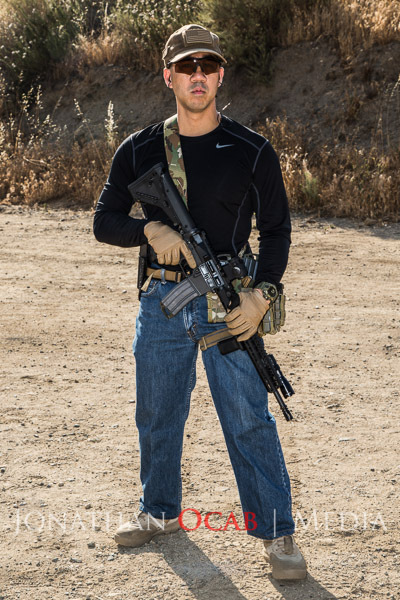 going from shooting shoulder to reaction shoulder). That said, I wasn’t all that happy with the Magpul MS4, which prompted me to order the Blue Force Gear VCAS. As mentioned before the VCAS is a two-point sling and when I placed my order with Blue Force Gear, I opted to get the sling in Multicam with two QD (quick detach) swivels since the Magpul UBR stock has QD swivel cups built in and I had a Noveske QD Direct Attach KeyMod mount to facilitate the forward sling attachment. I actually hadn’t installed the Noveske KeyMod QD mount when I was utilizing the MS4, but I bought the KeyMod QD swivel mount for precisely this type of situation. 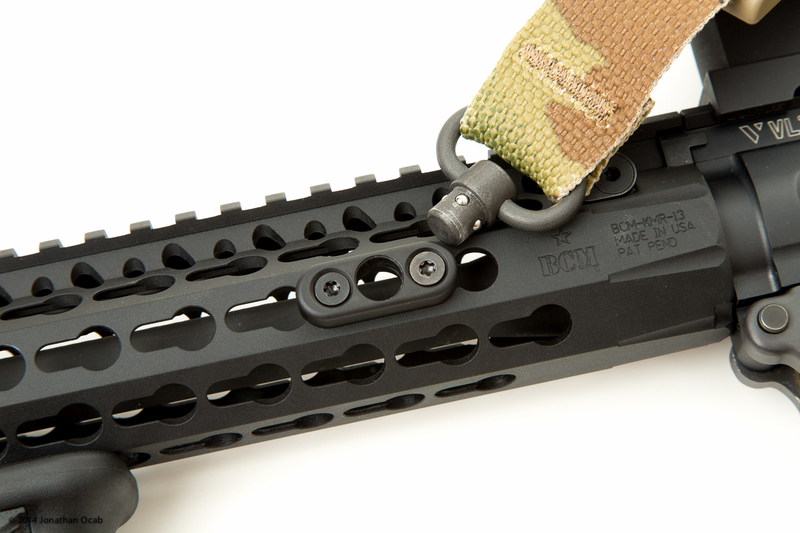 It is important to note that the Noveske KeyMod QD mount doesn’t allow the QD swivel to freely rotate 360 degrees. It stays locked in the orientation that it had when it was first inserted into the mount. I actually like this because i want the swivel to run vertically with respect to the bore line such that the sling runs directly towards the rear of the rifle (and my body). The above photo shows the swivel inserted into the mount at a 45 degree position (which is not how I attach), and the operator is free to attach it in the orientation that best suits the individual. I put in some repetitions at the range to run the sling through some drills and it felt very comfortable and natural to use. I didn’t feel like I was fighting the sling, specifically when it came to manipulating the safety. The rear (stock) swivel point inherently goes into a position/orientation when the rifle is mounted such that it says clear of my thumb. The padding (an extra option) on the sling also increased comfort during use. The padded portion of the sling was soft enough not to chaff the neck or shoulder, so you’re not getting burned up by the sling during repeated (un)mounting of the rifle. 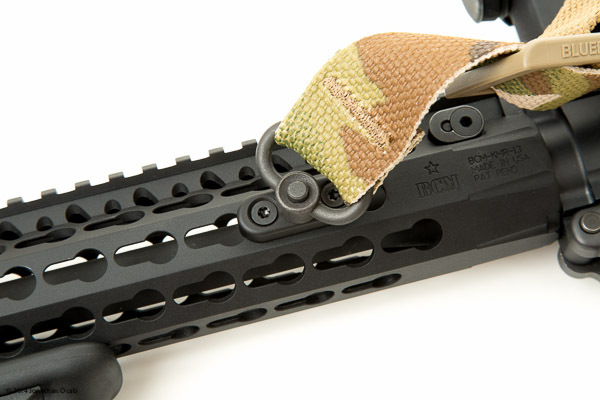 The one important feature of the VCAS which I didn’t demonstrate in the video clip or photos above is the quick adjustment buckle on the foremost part of the sling. 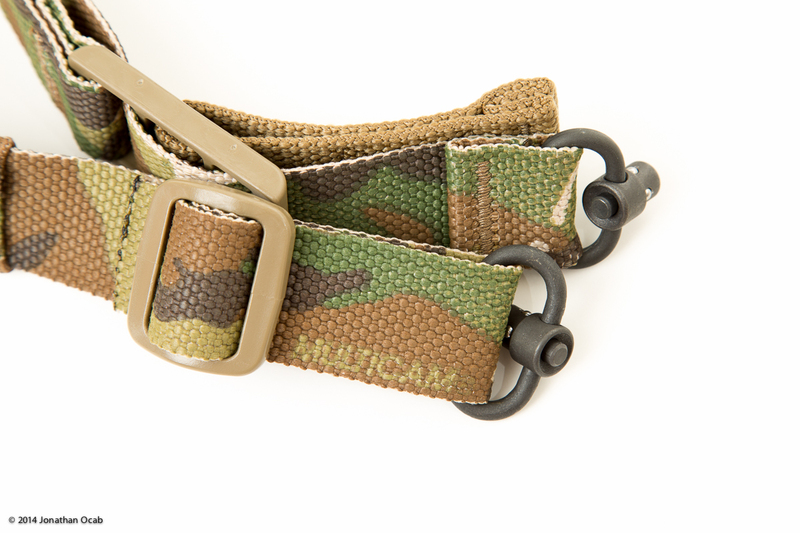 An off-color strap denotes the quick adjustment point and is the strap that the operator will grab and pull upon in order to give a quick amount of slack to the sling. This allows the operator to get more slack / sling length for the situation at hand (e.g. to facilitate switching shoulders, etc). Note the quick adjust ‘tab’ is Coyote in color vs the Multicam sling color pattern. So far, I am very happy with this sling and I am regretting that I didn’t buy this sling first. 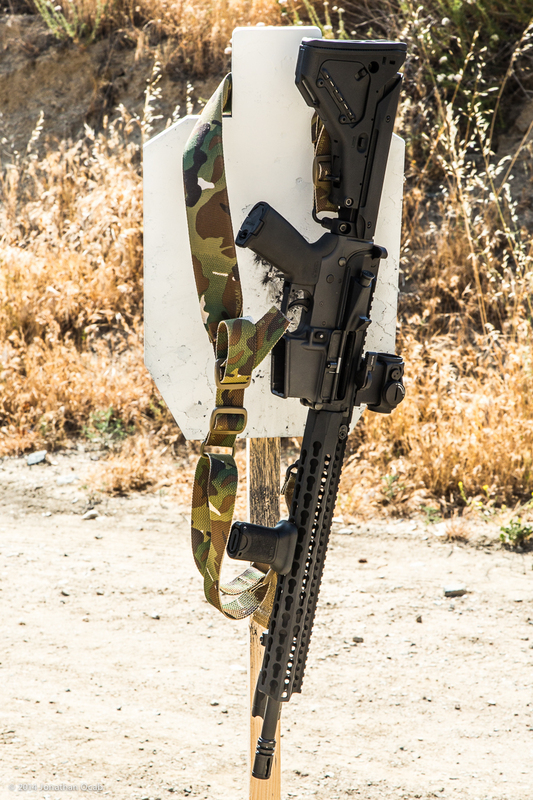 I was initially pondering the Viking Tactics (VTAC) sling (another two-point sling) before I opted for the MS4. I probably should have spent a little more time researching online and I probably would have bought the VCAS initially. I’m not sure what I’ll do with the Magpul MS4. Right now it’s in my rifle bag as a backup. Perhaps I’ll hang on to it and give it another try in a few months, or just keep it specifically for a backup / loaner sling. You can order the Blue Force Gear Vickers Combat Application Sling directly from Blue Force Gear at http://www.blueforcegear.com/. 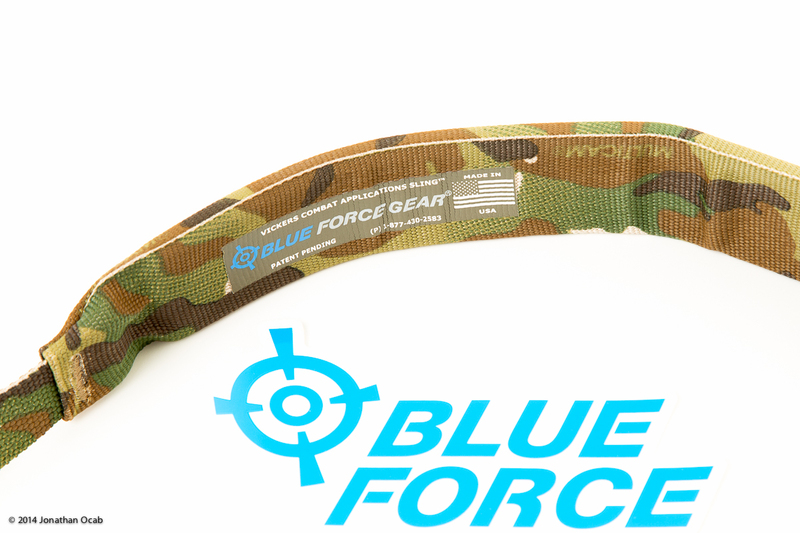 Definitely check out the Blue Force Gear website if considering a VCAS since there are a few different options you can select when acquiring a sling, so you can customize it as desired for your application. The cost of a VCAS will range anywhere from $50 to just over $100 depending on all the different options you select. 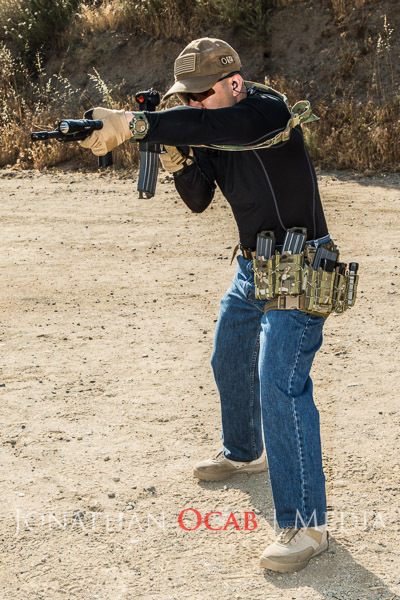 After much trial and error, I have found a way to use the Vickers Combat Action sling as a tight-as-can-be hasty sling and using it as such as dramatically improved the accuracy of offhand position out to 200m.